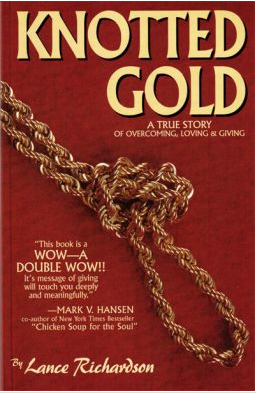 KNOTTED GOLD - A Great Book for Anyone Who Has Ever Suffered Greatly and Asked 'WHY? "I had spent the last several years nearly living in hospitals. The trials through which we had passed seemed almost too much to endure. Yet through it all, she had not only remained true, she had become my best friend. It was almost Christmas and I was nearly penniless. But I had to find a gift that would somehow express my incredible gratitude for her standing by me. The answer became...Knotted Gold. We would never again be the same." Knotted Gold is the true story about how Lance and Jozet Richardson came to understand that adversity need not destroy a marriage, rather it can bring strength. It is one of the most touching Christmas stories ever written. It is a powerful message about love, overcoming adversity, and building stronger relationships. "I couldn't put it down. I found myself moving from laughter to tears and not wanting to stop reading until it was over!" "One of the best books I have read in years! Its message goes far beyond a first reading!" "My husband and I read it together. We had been going through many trials ourselves. We came away with a whole new understanding of adversity and a wonderful appreciation for one another."